SALEM – Students, staff and campus visitors on ODOT’s Willamette Valley-serving bus – called POINT – will have a better location to get on and off the bus on the University of Oregon starting April 1. The new location on Agate St. near 15th Ave., in front of historic Hayward Field, now offers a paved boarding area with better lighting and easier loading/unloading for passengers using wheelchairs and mobility devices. ODOT partnered with Lane Transit District, the University of Oregon and the city of Eugene in this multi-year effort to secure an improved pick-up/drop-off location for the campus community. 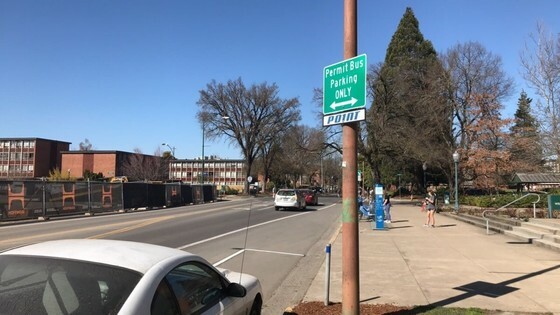 "The POINT service provides a convenient and environmentally friendly connection from Portland to the University of Oregon," University of Oregon Active Transportation Coordinator Josh Kashinsky said. "I'm excited that, with the support of the city of Eugene, we are able to bring this service closer to the center of campus and Hayward Field." The Cascades POINT bus runs from Eugene to Portland and back seven times each day, serves five cities and offers 51 roomy seats, restrooms, free Wi-Fi, power outlets, air conditioning and space for luggage and bicycles. Tickets are sold by Amtrak, and the service is operated in coordination with Amtrak Cascades passenger train service.